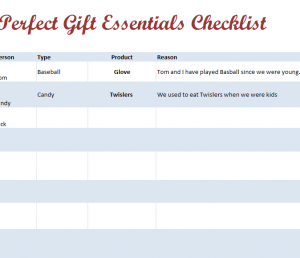 The Perfect Gift Checklist is the best way to organize your holiday purchases this year. The template adds a touch of the holiday spirit by including a section for sentimentality and how the intended gift will connect with the people closest to you. By organizing your thoughts into one clearly laid out document, you have the opportunity to make this holiday season the best your friends and family have ever experienced. Nothing beats a gift from the heart, that’s why this template will make all the difference; inspiring you to think up the greatest gift ideas you’ve ever had! Start by downloading the free file below by clicking on the link provided. From here, everything you need will be located on one page for your convenience. Once you have the document open, you can begin editing the template to fit your needs. Start by entering the names of everyone you plan to give a gift. In the next column, you can enter the type of gift you want to give them, then the name of that specific product. The “Sentimentality” column is what really sets this template apart. This gives you the unique opportunity to reflect on your gift idea and describe to yourself why you think this would be the perfect gift. Maybe it connects with your shared childhood or it reminds them of their favorite artist. Thinking about this beforehand will take a good gift idea and make it into a great one. The last 4 sections are simply there to help you organize your shopping list. They include convenient images associated with each category. Here you can enter: the location of the gift, if you have purchased the item, if it’s been wrapped, and finally the price of the item for your records. This template really helps you keep in mind what is important about this season. You want to give the people you love something to reflect the joy and happiness they have brought to you over the years. This document lets you think about this symbolic gesture and allows you to pick the perfect gifts for the people closest to you. Make this year unforgettable with the Perfect Gift template. Pick the perfect gift this year with this simple template!